1.Set Preview to Real-time in mlv_lite settings. Maybe this will be a lot helpful if we can only enable Anamorphic without global draw for best performance. After pressing recored of course the liveview becomes a bit more choppy, we can add something like "Disable anamorphic or change liveview to Frozen"After pressing record (whatever if that really necessary). But it still a lot better than Framing mode, Make your tests for recording times and performance! 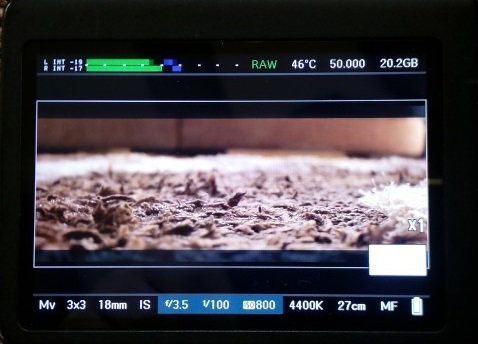 Edit: We will have wrong aspect ratio framing for lower aspect ratio, Anamorphic will preview the full areas of sensor in the top and bottom but actually it's cropped depended on aspect ratio (we can fix it easily by adding some Anamorphic adjustment settings). And if I am correct, as I know for x5 mode the full cropped area is 2520x1080 (Canon 700d) but canon only shows part of it in liveview instead of, in the Framing mode (mlv_lite) shows the full cropped area (I don't know what the way to get Framing preview (in code)), so if we can only stretch down horizontally and vertically the liveview to fit in LCD display like the Anamorphic does we will have the Real-time Framing preview. Re: Mostly real-time framing preview for stretched 3x3 bining 50/60fps liveview! You can also setup "disable global draw" on half-pressed shutter. This is how I work with 3x3. I have a choppy preview (anamorphic desqueezed) and if I need better realtime preview, I just halfpress the shutter. Yes I know that, thanks! Any progress at all regarding realtime preview with proper framing automatically makes you a true hero among heroes on here, theBilaFakhouri. This would allow action footage to be properly filmed, along with the ability to use a steady cam type support for stabilized moving and panning sequences. This just isn't really possible at present with a horribly lagged framing preview which seriously debilitates all of the other wonderful accomplishments with Magic Lantern in my opinion. Curiously, with the settings you posted on this thread using the 700D, I'm able to go into 5x crop (3x crop mode technically) mode and record RAW 2240x1080 with one of Danne's built-in scripts. I'm assuming that it is recording with forced 3x3 binning at RAW 2240x1080, but the footage looks fine and realtime preview seems to have near 1:1 framing with just a little bit of lag during record. Compared to normal framing preview at 5X crop, it's the difference between night and day; one could most certainly use a steady cam type support device and record. I'm just not sure I can live with 3x3 binning though, as this would really leave footage vulnerable to moire and aliasing. Still, this is very serious progress on your part, wow, and thank you for posting your research!